It was only a couple of days before Christmas as we approached Newport, bringing the J Boat up from Florida. The warmth of the Gulf Stream was behind us, and the forecast ahead promised stronger headwinds and lower temperatures. Much stronger and much lower. Hypothermia could be a problem, but getting around the foredeck, especially with the possibility of icing, would certainly be a problem in the heavy weather conditions. The sooner you confront reality, the more likely you will have a favorable outcome. Conditions don’t need to be as radical as those we experienced on that December approach to New England in order for them to become problematic. Gale force winds or lighter can be daunting to the unprepared. The better option is for preparation to begin now and when conditions are more to your liking. While conditions are light you can check your sails to make sure they’re in good shape. Do you have enough reef points to be comfortable in 40 or 50 knots of wind? Three would be a good start on most boats, but if you don’t have more than a couple of reef points, how well do you know your storm jib and storm trysail? If the conditions are bad enough they could become your new, best friends. More than a passing familiarity would be worthwhile. 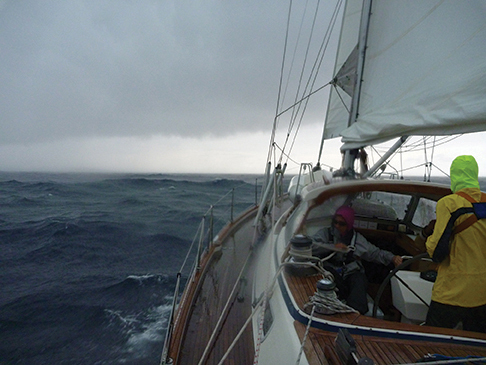 In light conditions, go out, set both the storm jib and storm trysail and heave to. You’re now probably set for wind speeds to get up to 50 or 60 knots, depending on your boat and the actual sea state. As you set your storm sails, review the trysail track, the tools required to open the gate, and the sheeting angles. Does the trysail sheet rub against the dodger? Can you run the sheets cleanly to blocks on the aft quarter, or do you need to use the mainsail’s outhaul on the boom? Having options means you can deal with a wider variety of problems, should they occur. Do both storm sails have sufficient leech hollow? If not, in high winds the leech is likely to flutter wildly, adding to wear in the sails and vibration in the rig. Does the storm trysail have a leech line that extends up the leech, over a bullet block at the head, and down the luff for easy adjustment at deck level? Or will you need to climb up on the boom in order to tighten the leech line in storm conditions? One option is relatively easy. The other presents yet another level of risk. You won’t know until you actually look at those sails and start to consider the possibilities. Years ago, prior to doing my first ‘round the world race, I was told that sailing is about awareness. The more aware you are, the more you anticipate and can reduce risk. Know your boat, sails and rig, as well as what the weather looks like prior to your departure and throughout your passage. Have a list of contacts handy, and plan an exit strategy for any heavy weather that is anticipated long before it’s actually confronted. On deck prior to departure you have probably run jack lines on both sides of your boat and have hard points in the cockpits to which you can attach tethers. Your storm sails should be folded with the luff securely tied, ready to immediately attach the tack to the bale in storm conditions. You will want to always have that sail under control, readily able to be connected to the boat, even in rough seas with waves breaking over the deck. Those sails are designed to be used in heavy weather conditions, and those may be the conditions in which you’re handling them on deck. Your sheets, halyards and other lines should be chafe free, and you will want to have a couple of spare lines neatly coiled and hung near the helm. If you need to quickly drop the main and secure it or drag warps off the back of the boat, you won’t want to waste a lot of time looking for suitable lines. Down below, you will want to have your grab bag ready with all of the necessary gear for an emergency. Sea sickness pills, sunblock, power bars, fresh water, VHF handheld, flares, spare rigging knife, any necessary medication and other things can all be put in place long before departure. Everything that can move or fly around should be secured prior to departure. That peanut butter jar on the counter can provide a serious injury if it becomes a missile flying across the cabin in a knockdown. Stowed gear is safe gear. Handholds should provide security every step of the way down below. If not, as heavy weather approaches make sure that lines are strung below that offer additional handholds. Meals should be simple but plentiful during heavy weather. Boiling water should be avoided, and whenever the boat is in a seaway, the cook who has hot liquids or other things on the stove should consider wearing foul weather gear. I know one woman who burned herself with boiling water when the vessel was 3 days from port. Once she arrived, deep in agony, she had to spend another 3 days in a hospital. Foul weather gear, or avoiding hot water entirely, could have averted that anguish. Other things to consider prior to the onset of heavy weather include charging batteries, filling day tanks for fuel and making sure fuel can run to the engine from tanks on either side of the boat. Awareness of your vessel also implies that you know your sinks down below don’t back siphon when heeled over on extreme angles and your manual bilge pumps work with the rubber bellows in good shape. The notion that your hatches don’t leak should be a “no-brainer”, but, given the fact that one of the boats on which I did the Whitbread Round the World Race had hatches nicknamed “Niagara” and “Victoria”, I know better. They often do leak, and this spring you can change that if necessary. Dealing with heavy weather doesn’t need to be a horrifying test of character. Your crew should be well rested, fed, dry and warm at the beginning of the heavy weather and that healthy state should be maintained. Hypothermia can even occur during the summer if the water is cold enough and crew chilled long enough. Preemptive measures for seasickness should be taken early by those who MAY need it, and everyone should know the location of their flashlights, headlights, rigging knives, the boat’s tools and emergency equipment as well as their personal gear. All of these things can be addressed long before the onset of heavy weather, and it can be reviewed periodically. Preparation will soften heavy weather’s blow, but the rubber really meets the road when heavy weather actually strikes. Throughout the actual storm, crew safety must remain paramount. Clip on to stay on. Change down your sails early. Winds often pick up at night so act accordingly before nightfall. Convective clouds often have gusts, especially as the clouds approach, and at night you probably won’t be able to see those clouds approaching. Movement on deck can be difficult and risky in storm conditions. When walking on deck, walk on the high side of the boat to get near the task and then across the deck if the task is on the leeward side of the boat. The further and more frequently you can stay away from the water, the less likely you will be thrown into it. Use of the jack lines, starting while you are still safely attached in the cockpit should be standard operating procedure. If walking forward is too tricky, crawling forward is always an option. In the extremely rare circumstance of winds exceeding 90 knots, crawling would be the only option anyway. It’s probably a reality you would prefer to avoid, so make the necessary adjustments long before crawling is your only choice. When hooking up a new headsail, attach the tack immediately to keep the sail on the deck as waves crash across the foredeck. And when attaching the halyard to the head of the sail, look up before you hook up. If that halyard is wrapped behind other halyards or looped behind a spreader, you will create more problems for yourself and could damage the rig. When dropping sails, always stand to weather of the sail, NEVER between the sail and the low side of the boat. If the wind, waves and sails conspire to go over the side, you don’t want to be among them, swimming for your life. If you’re tangled up in sails or lines that are being blown overboard, you may not have a choice in the matter. Stand and work to weather and remain clear of sails and lines at all times. Despite some of the harsh reality expressed above, safety and awareness become habits and second nature if practiced regularly. Eventually, the storm will blow itself out or move away. As the weather clears, re-fold the storm sails and put things away like you will use them again, and the conditions at that time may not be very nice yet again. A very experienced friend of mine once told me, “The more I practice, the luckier I get!” Heavy weather need not be a daunting experience, given enough practice in moderate conditions. In fact, it can be a unique and wonderful view into another aspect of nature. Practice often and enjoy the ride.